When spring rolls around, the flowers start growing and so does your business. It can be stressful watching your jobs pile up. If you feel like you’re drowning in paperwork, try Smart Service. 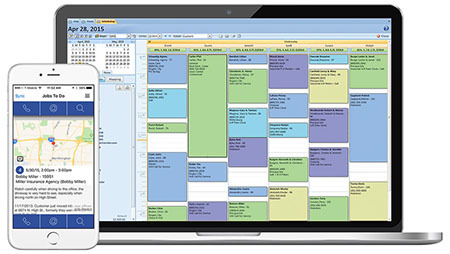 Smart Service manages your schedules and integrates with QuickBooks. No more double data entry for you! Your field workers will be happy with a clear and optimized schedule, paperless forms and signatures, and easy routes. Smart Service, the lawn maintenance software for QuickBooks, will declutter your office and put more time into your hands. Scheduling a new job can be confusing. When tracking down previous job and customer information while trying to find the best appointment time, mistakes get made. Mistakes are costly, especially in terms of time. Smart Service lawn maintenance software for QuickBooks takes care of all the nitty gritty by putting your schedule online. What was once a costly hassle becomes quick and easy with lawn maintenance software for QuickBooks. Your schedule links up with QuickBooks to pull up existing customer information to make an appointment. Newly created jobs instantly populate with customer name, address, contact info, past job history, equipment history, and notes. You don’t have to worry about double booking or wasting time! When you’re taking care of someone’s lawn, you establish a personal relationship with that client. You want to be available to them in case something comes up and they have to reschedule an appointment. Even with last minute appointments, you can easily dispatch your lawn care technicians with Smart Service. Easily schedule jobs for a technician with the push of a button. Even if they are out on the field, these updates can reach your technicians with the Smart Service lawn care dispatch app! No more wasted time spent playing phone tag between your customers and your technicians to solidify an appointment. Up-to-date job information gets your technicians where they need to go! Smart Service optimizes and digitizes your business and scheduling functions, both in and outside the office. Our lawn maintenance software for QuickBooks uses its dispatch app to connect you to your technicians. You will be able to schedule jobs for your technicians while they’re on the go, and keep track of their job progress. Keep track of your technicians’ whereabouts using GPS information. The app also gives your team the ability to fill out forms and collect signatures and payments through their phone or tablet. Smart Service takes this information and provides a ready-to-bill invoice directly to QuickBooks. Smart Service integration with QuickBooks helps your lawn care business run smoothly and become more profitable! Nobody ever complained about a green lawn—or a green wallet. Request a demo now to see how Smart Service can optimize your lawn care business functions and save you money! The grass should be greener on your side.